New Zealand refit specialist McMullen & Wing has relaunched the 34.18 metre Alloy yacht Akiko. Formerly known as VvS1, this tri-deck explorer yacht was hauled out in July for an extensive five-month refit at the Auckland-based yard. 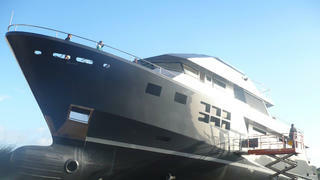 Full details of the refit are yet to be revealed but this pre-launch image shows that her red hull has been repainted. Built by Alloy Yachts to Lloyd’s Registry standards and MCA compliant, Akiko was first launched in 2007 and went on to pick up five major honours at the 2008 World Superyacht Awards. Her aluminium hull and superstructure encompass a total interior volume of 281GT, while the exterior styling and naval architecture were created by Canadian designer Gregory C. Marshall. Her accommodation sleeps up to eight guests in four cabins, comprised of an owner’s cabin, a VIP double room and two twin cabins. Meanwhile, the crew quarters allow for a staff of up to six people. Formerly offered for charter in Fiji, Akiko features a covered superyacht sundeck with room for al fresco dining and a Teppanyaki grill. Power comes from a pair of 425hp Caterpillar 3406E diesel engines which can deliver a top speed of 13.5 knots. When trimmed back to her cruising speed of 12 knots, Akiko boasts a maximum range of 3,100 nautical miles thanks to her total fuel capacity of 34,020 litres. New build projects recently completed by McMullen & Wing include the 49.95 metre explorer yacht Project 1016, which was launched earlier this year.